Every Thuersday. From April to the end of October 2019. Guided biking tours through the UNESCO Wolrd Heritage region of Hallstatt Dachstein Salzkammergut. For organisational reasons, please register for this event. 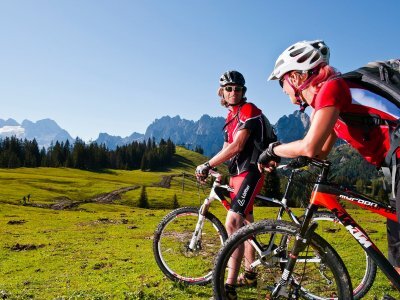 Speed, adrenaline, sports action or just enjoy unforgettable views of the overwhelming natural scenery of the UNESCO World Heritage region of Hallstatt Dachstein Salzkammergut - this is mountain biking around Lake Hallstatt and Gosau Valley. The unique combination of majestic mountain landscape with green pastures, rustic huts and crystal clear lakes make for a variety of mountain biking tours around the region of Lake Hallstatt. Accordingly, the infrastructure for mountain biking is well developed here: Start your mountain bike tour from the doorstep of your holiday home! You do not get up a mountain with no prospect of a trail? Our guides will take you on a relaxed Salzkammergut tour followed by a descent over hill and dale on selected soft trails. The biker's heart is laughing.